Templates for the illustration of professional benchmarking concepts in PowerPoint. Convey the Benchmarking Method with the help of definitions, explanations, graphs etc. in one illustrative PowerPoint presentation. Use the information to find the right method for your business and implement comparative analysis. Benchmarking is defined as a continuous process of analysis, in which a company's products, services, and procedures are compared with those of its most competitive rivals. After establishing the comparison, weaknesses should be identified and replaced with better methods for improved performance. The targets of this process are to increase customer satisfaction through quality improvement and reduce costs through process optimization. There are different types of benchmarking, which are differentiated primarily between internal and external comparative analysis. In the first method, comparisons are not carried out with the strongest competitors, but only within a company and its various departments. Clearly convey to your employees this principle of "comparing and contrasting," by linking together different targets, measures, advantages and disadvantages with the help of definitions and diagrams in your PowerPoint presentation. This product includes professionally designed slides that define benchmarking, pros and cons, explanations of the different basic types, differentiation of internal and external benchmarking and information on implementing the analysis. The slides are provided with graphical representations such as graphs, tables and charts, so that you can comprehensively convey this complex system of comparative methods. 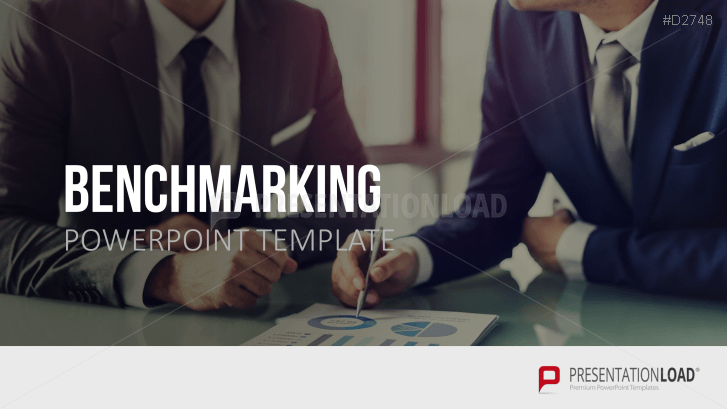 choose from several graphs explaining the term, "benchmarking"
I´ve been working with your templates for two years now. Thies template is just as great as usual.